“For 1,000 days (a little less than three years) the priests would eat a special diet consisting only of nuts and seeds, while taking part in a regimen of rigorous physical activity that stripped them of their body fat. They then ate only bark and roots for another thousand days and began drinking a poisonous tea made from the sap of the Urushi tree, normally used to lacquer bowls. Comic-worthy material, I’m sure you’ll agree. PS. There were 22 James Bond films, in case you’re wondering. 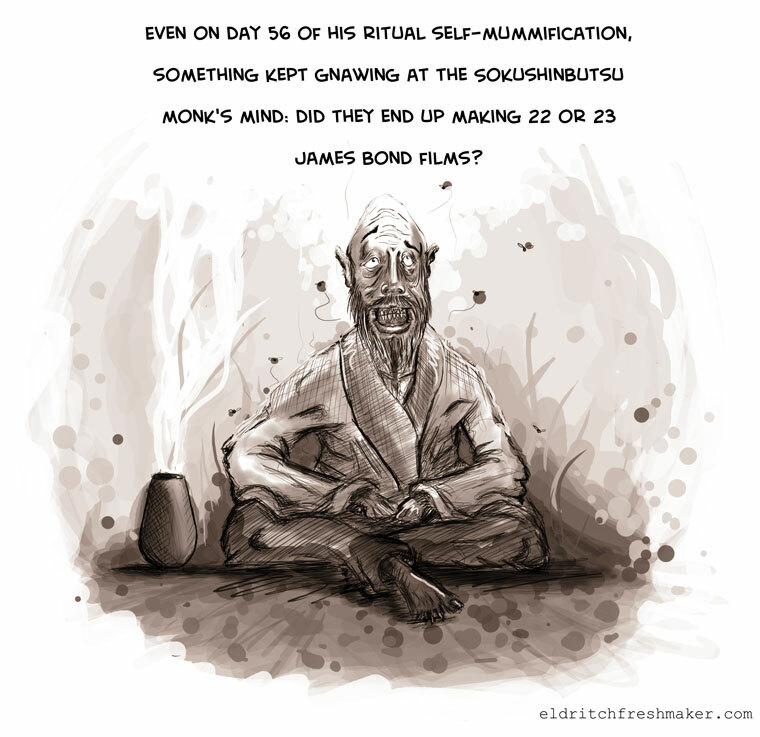 Even on day 56 of his ritual self-mummification, something kept gnawing at the Sokushinbutsu monk’s mind: did they end up making 22 or 23 James Bond films? This work, unless otherwise expressly stated, is licensed under a Creative Commons Attribution-Noncommercial-Share Alike 2.0 Belgium License. Posted by Tanja Guven at August 16th, 2016 at 4:40 pm.